The ABS team has grown! · ABS. A Better Way. We would like to share a warm welcome to not only one, but THREE new starters here at ABS HQ! 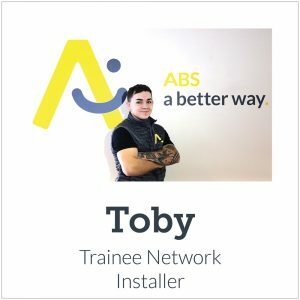 Toby joins us as a trainee networking installer, Katie as service administrator and Hannah was recruited internally to the sales and marketing department as our new customer relationship advisor. We called on Toby to help support our ever-expanding customer base with photocopier, printer and managed print deliveries, installations, networking and training. He’s good at posing and bad at reaching the top shelf. 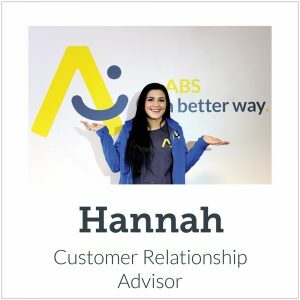 Hannah has been part of the ABS team since February 2016 where she has been one of the main points of contact for customers, particularly monitor printing equipment, toners & preventative maintenance through our remote monitoring software. As our new customer relationship advisor, Hannah is ideally positioned and has the experience to spend time with current customers to review and report on print as well as showcasing our expanding portfolio of both document and IT solutions. Hannah is excited to be on the front line, using skills from her previous role to help customers get the most out of their print with ABS. Her knowledge of products and our services makes Hannah a perfect fit for this role. Here is Katie, good at baking and bad at directions. Katie joined us to fill the role of service administrator vacated by Hannah. Katie, a local girl from Elland, has already infected the office with her bubbly nature and has wasted no time in soaking up the vital information and skills needed to deal with customer queries. Her interest in chickens has blown our minds! Katie keeps a coup of 50 rare breeds and presents them at poultry shows. Welcome to the family Toby and Katie and good luck to all of you in your new roles here at ABS. 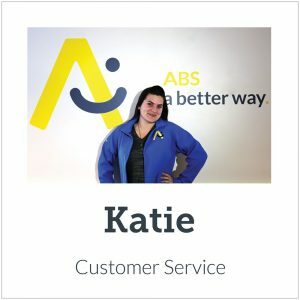 You can meet the rest of the ABS family and find out what they are good and bad at by clicking here.